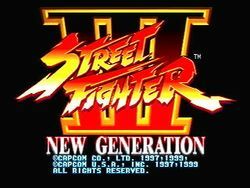 Street Fighter III (aka Street Fighter III: New Generation) is the true sequel to Street Fighter II (the games in the Street Fighter Alpha trilogy were prequels). It was updated twice (Street Fighter III: 2nd Impact and Street Fighter III: 3rd Strike), adding new fighters to the roster each time. This series introduced some new concepts to the Street Fighter series, such as parries and the ability to choose only one Super Art out of a selection to utilize during a fight. Last but not least, it featured a boss, Gill, who could not simply be mirror imaged when facing the other direction because he was one color on one half of his body, and another color on the other half. The game was the first to make use of Capcom's CPS3 arcade hardware, a large upgrade from the previous CPS2 system that many Capcom Fighting games were developed on. The CPS3 system allowed for much larger sprites, with many more frames of animation, as well as hardware scaling that allowed the scene to be drawn up close when two fighter were near each other, and farther away when the fighters were apart. The result was some of the most fluid and impressive animation seen in an arcade at the time. Street Fighter III depicts the events of the third World Fighting Tournament. Initially, Ryu and Ken were the only returning contestants, but fan demand brought Chun-Li and Akuma back in subsequent editions. A little older, wiser, and battle hardened, Ryu and Ken were up an entirely new cast of fighters. Some had ties to the older warriors, such as Sean who was Ken's student, and Yun and Yang who were the grandchildren of Gen. Others were completely new to the scene. This page was last edited on 13 May 2010, at 17:46. This page has been accessed 69,361 times.